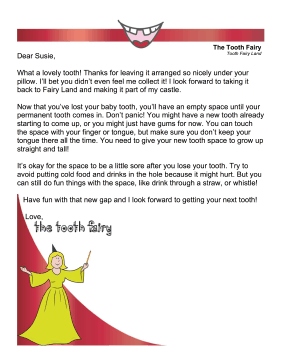 Help children learn the fun things they can do with the space where their tooth used to be using this printable tooth fairy letter. What a lovely tooth! Thanks for leaving it arranged so nicely under your pillow. I'll bet you didn't even feel me collect it! I look forward to taking it back to Fairy Land and making it part of my castle. Now that you've lost your baby tooth, you'll have an empty space until your permanent tooth comes in. Don't panic! You might have a new tooth already starting to come up, or you might just have gums for now. You can touch the space with your finger or tongue, but make sure you don't keep your tongue there all the time. You need to give your new tooth space to grow up straight and tall! It's okay for the space to be a little sore after you lose your tooth. Try to avoid putting cold food and drinks in the hole because it might hurt. But you can still do fun things with the space, like drink through a straw, or whistle! Have fun with that new gap and I look forward to getting your next tooth!